Waste Not, Want Not!- Your compost bin thanks you. Look at them as a “Buy one, get one free” item: buy the root vegetable and you also get a whole bunch of nutritious greens for the same price. These beautiful bright-green tops not only help keep the carrots fresh, but they’re downright tasty. 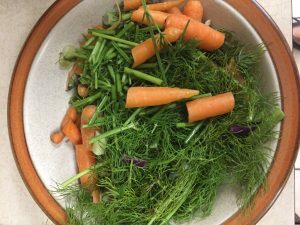 Carrot tops are herbal, earthy greens that have a slight taste of carrots and are great to turn into pesto or sautéed as a side dish. 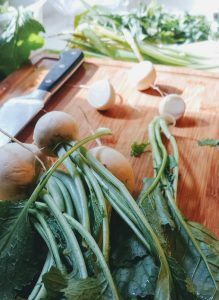 Like the turnips themselves, these greens can have a bitterness best tempered by cooking with with strong, flavorful ingredients like bacon, onions, stock, or even a little bit of vinegar. The delicate tops of radishes pack a surprising pungent kick of flavor that’s a bit reminiscent of strong, peppery arugula. And just like arugula, you can eat them raw in a salad or gently wilt them into pasta or other cooked dishes. Beets are such a great deal when you buy them bunched: you get sweet beets and a whole big bunch of greens all in one! Beet greens have a texture and flavor very similar to Swiss chard, and that’s the best way to think of them. 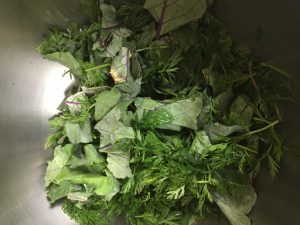 Use them in a stir-fry, braise the greens, or even very thinly slice them raw for a salad! If you’re lucky enough to find celery root with the tops still attached, get them! Although it’s usually grown for its root, celery root tops are not to be tossed aside — the stalks and leaves are stronger in flavor then regular celery but still delicious. Use them anywhere you would celery, even in soups and stocks!